Every year we are stuck with different challenges, but these last two years in Northern Michigan have brought a lull that’s hammered us with cold weather. For steelhead anglers these last two months have been insurmountable. The Manistee River, Michigan’s most heavily fished and well known, has been nearly unfishable and fishing was poor, at best. Since winter settled in almost the whole river was covered in ice and Lake Manistee has been frozen. Even at High Bridge (the first bridge below the dam) 75 percent of the river was frozen. We haven’t been able to launch most of the time. The river had a foot to 18 inches of ice and I’ve never seen it like that. When this happens there’s not a lot you can do. I told guys to take up ice fishing until the thaw. Fortunately, the thaw is here. 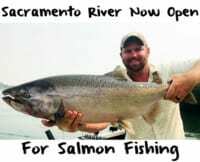 And, while the river hasn’t harbored many steelhead these past few months, that’s likely to change quickly. I believe the steelhead that came in during late summer and fall got pushed back to Lake Michigan by the ice and are waiting for the ice to clear to migrate up. We still have snow on the ground, but I see green grass, too, and the ice has been retreating daily. Spring is here now and I’m guessing the steelhead are going to come in big numbers, too. The best thing that has happened so far is we didn’t get a torrential spring rain. If that happened our fishery would have been over. 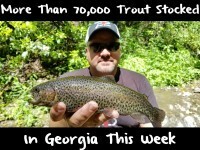 The steelhead would have spawned overnight. The lack of rain is making the river not go over the banks. We still have high water, but we aren’t in flood stage as we could be. The melt is happening slowly, which is allowing us to steelhead fish longer. It’s still tough to overlook that things aren’t as they should be. For example, the area around Tippy Dam doesn’t have a lot of steelhead and it should. However, the ice kept the fish from coming upriver and they simply aren’t there yet. Our run is extremely late. Because of the bitter cold, we are two or three weeks away from normalcy returning. On a positive note, Lake Michigan just opened its mouth enabling fish to start trickling in (it had been frozen shut for months). The whole system has very few fish right now. There are a lot of guys that aren’t catching anything. In fact some aren’t even getting bit. Even though it just started days ago at this rate, fresh fish are coming in daily. For a while, the fishing was slow. Actually, it’s been slow since November. If you got one or two fish, you were doing good. Now that new fish are coming in it’s getting better every day. I’m expecting the rest of March to be good as these new fish arrive. It will at least outperform what we’ve been through. I’m expecting a late run. We’ll likely get fish through May this year and typically, it’d be over on May 1. It’s no secret guys float a ton of eggs here. There’s an egg bite daily, and that will be the case until the water gets high and muddy. At that point I’ll switch to plugs, namely Wiggle Warts. Yes, I know, I’m old school. Other guys will run FlatFish and KwikFish. For now, however, I’m using cured spawn and so is everyone else. I’m using scraped steelhead eggs and curing them in Pink Fire Cure. Some of the guys around here use Natural FireCure and lots of guys use the BorX O Fire. All of us fish them in sacks. I’m a pink guy, but lately I’ve been trying white, chartreuse and peach spawn sacks. Locating steelhead the past two months hasn’t been easy, because there weren’t many around. Now that conditions are changing the first thing I do in the morning is go and try typical spots, which would be slow moving water behind a log jam or rock. Then I work my way towards gravel to see if they’ve migrated that direction. You’ll find that once you find the fish, you’ll stay in that kind of water. But, with fewer fish in the system right now you need to be all over the map, pin point them and then go for it. Editor’s Note: Veteran steelhead guide Mark Chmura has been featured in nearly every Great Lakes steelhead magazine, national publicaitons and TV shows. 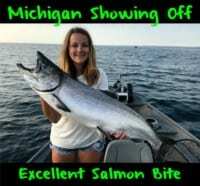 For more information on his Manistee River steelhead trips please call 231-233-1579.